It’s soup season! It’s getting colder in Chicago every day which means warm foods and warm foods only. Also, adult hot toddies - those are an important part of the winter nutritional pyramid. 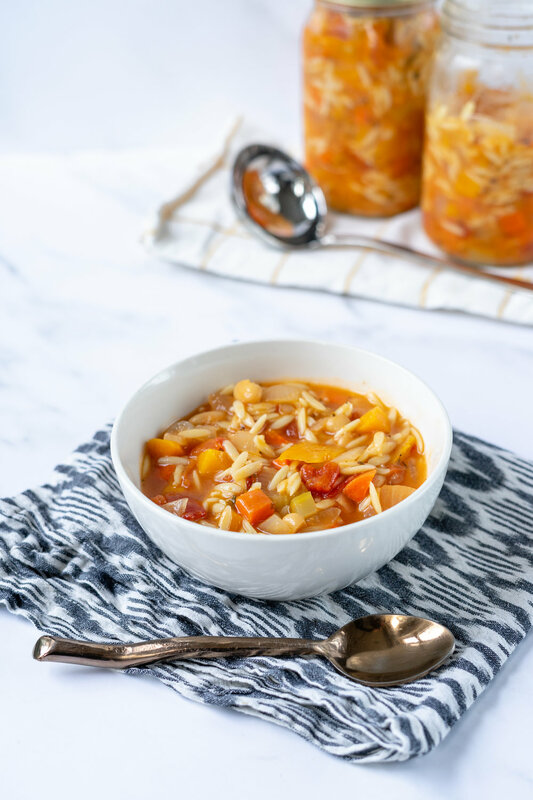 I loved making this soup because the majority of the ingredients are nonperishable, which for me means I probably have them regularly stocked in my pantry. If I’m out of fresh produce, it’s always convenient to have canned goods on hand. 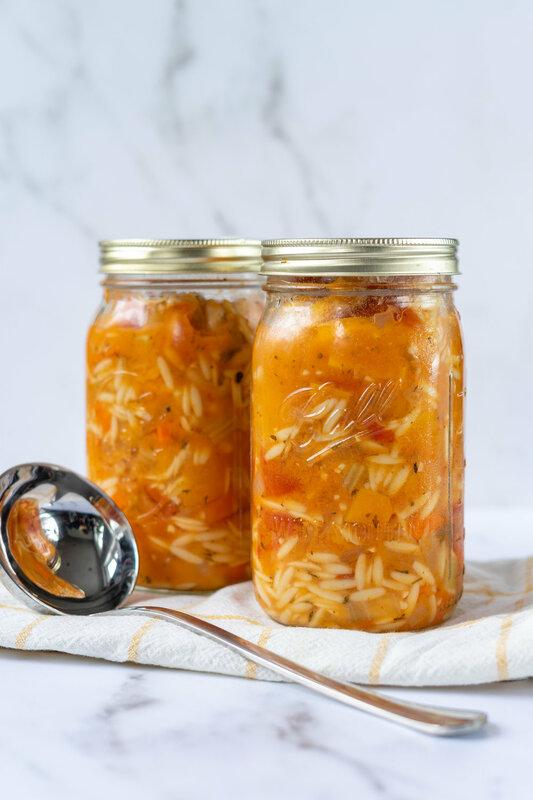 This minestrone is also an easy and nutritious meal prep recipe. I’ve been busier than ever with my freelance work this fall, so having a couple meals already made after a long shooting day is a major life (and time) saver. I was trying to think of “fall inspired” recipes all October. Pumpkin is overplayed these days, and butternut squash is getting there, too, but hot soup on a chilly November day will never get old. I bought pre-cut butternut squash only because I’ve been in a constant time crunch lately, but if you have the time (and knife) to cut it yourself, you can save a few dollars. A pre-cut package of butternut squash runs about $3-4 while the whole vegetable is only about $2. If you’re a vegan/vegetarian/plant-based eater like myself, then you’re probably not going to use a chicken based broth or stock, which sometimes means a less overall flavorful meal. Sorry but vegetable broth really lacks the savory flavor I look for in cooking. Luckily, there’s Better Than Boullion No Chicken Base, a paste-like kitchen staple for me that acts as the perfect substitute for chicken broth. I use it in all my soups, ramens, and even to steam vegetables occasionally. Minestrone is packed with vegetables and protein, making it easy to meet multiple macro goals with one serving! The standard minestrone recipe uses be green beans and kidney beans, but I chose cannellini beans because they’re higher in protein and I prefer the flavor. I hope you enjoy this soup and stay warm this fall! Mix the Better Than Bouillon No Chicken Base with the 6 cups of water - the paste will dissolve while you prep the other ingredients, so don’t stir for more than a minute or so. Mince the garlic, cube the butternut squash, and dice the onion, carrot, and celery. Add about 1/3 cup of the broth to a large soup pot over medium heat along with the garlic, onion, and celery. Once fragrant, then add the carrot, butternut squash, and crushed tomatoes, stirring occasionally. After about a minute or two, add the rest of the broth with the Italian seasonings and dried parsley leaves. Bring to boil. Once boiling, add the pasta of choice and cannellini beans, again stirring occasionally. After about 7-8 minutes, taste test the pasta to see if it’s done cooking. Serve immediately or store in seal-able mason jars. If unopened, this soup will last up to two weeks.